At this time of year, most of us are preparing for holiday celebrations and gift-giving. Many of us are also thinking of another kind of giving -- giving back. We give our time, money, and items to charities dear to our heart. Ideally, we want our children to join in to help them start thinking beyond themselves and appreciate all they have, but sometimes it is hard to find meaningful ways to include them. I've compiled a few ideas below to help get you started. I actually found too many ideas for one post, so I also made a Part 2! A simple way to start this time of year is to pick a wish list for a needy person from the YMCA (though they have all been selected already this year) or your local place of worship. Have your child select the person, or pick someone their age or the age of someone they know. Give the kids a budget (maybe after you use a free internet tax calculator to figure out how much your return will be) as they select the gifts. You can guide them by saying things like "This man is about Grandpa's age. What do you think Grandpa would like?" When we did this a few years ago, we selected a boy about my son's age (age 8) who wanted Legos and pajamas. My kids searched the racks to find pajamas in a Lego theme, since they knew the boy liked Legos. They then decided on a Lego set that could be built in three different ways because they thought it would make the boy feel like he had three sets, instead of just one. Other simple ways to encourage care and giving throughout the year are to make cookies for a sick friend, send thank you cards to the local fire fighters, or rake leaves or shovel snow for an elderly neighbor. For several years, one of my in-laws Hanukkah gifts for the kids was $10 each -- not for them to keep, but for them to donate in their name to a charity of their choice. My daughter decided to add in some of her own money to "adopt" a chinchilla at the Turtle Back Zoo. She wanted to help the zoo take care of one of her favorite animals. She loved getting the photo of her adopted pet in the mail with the thank you note! My sports-loving son came up with the idea to donate to an organization that helped kids pay the fees to play sports. We had never discussed how much it costs to play sports (especially travel sports! ), and I was so in awe of his thoughtfulness and realization that money was a barrier for so many kids to do so! I had remembered seeing a sports equipment collection at our synagogue, so I contacted the temple's community service coordinator. She spread the word, and we eventually came across Teams For Kids Foundation, founded in 2014 by a local teen who would volunteer at homeless shelters in Morristown. She started this non-profit organization to raise funds to enable underprivileged kids in New Jersey to participate in recreational sports. It was exactly what my son had envisioned! Having my kids decide on just the right recipient of their donation really made a huge impact on them. In addition to money donations, many organizations are looking for specific items to be donated. If you want to help your child collect items, first start with an organization that interests them, then check out their Web site for current items needed. Then they can make flyers to distribute to friends, neighbors, and family that give details as to what they are collecting, when they will collect it, and where the donations will be going. Interested in birds? Ask for bird seed, artificial Christmas trees, and paper towels for The Raptor Trust. Like puppies? Collect dog food, old blankets and towels, and pet collars for St. Hubert's Animal Welfare Center. Into art? Call a local women's shelters or children's hospitals to see what they need. Love to read? See if your friends know teachers in under-privileged areas and hold a children's book drive to increase their classroom library. A friend of mine had a connection with a school in a low income area. She invited several of her kids' friends to her house on MLK Day. Each kid brought some of their own books to donate, then decorated a book bag, and selected books to put inside and be donated to the students in the school. 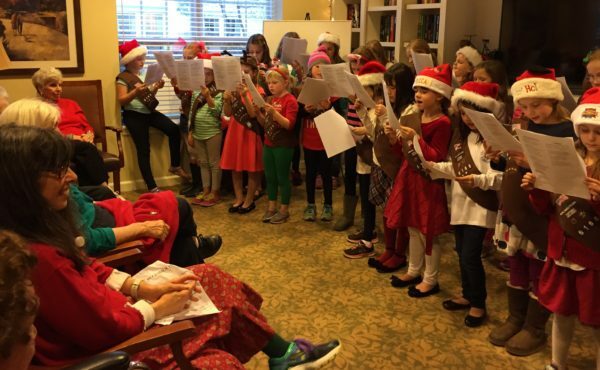 I recently contacted Brighton Gardens, an assisted living center on Ridgedale Avenue in Florham Park, to schedule my Brownie troop caroling. When I also asked about ways families can volunteer, the activities director, Joanie, said that they are always open to having families schedule a time with her to visit with the residents any time of year. They can do things like make crafts or play games with the residents, and they really appreciate seeing the little ones (she said especially babies and toddlers!). Think creatively about your child's interests. How about offer to do a concert so your child has an audience to appreciate his years of piano practice? Or have your young reader read to the residents? If your child loves baking, see if a senior center would be open to having her bring in sugar cookies to decorate with the residents. Find an activity that matches your family's interests and share it with the seniors. Since Brighton Gardens is an assisted living facility and not a nursing home, the children might not be as tentative with the residents. There are several assisted living facilities in the area, so contact any one with your creative ideas. Several organizations hold volunteering events that the whole family can do together. The first Saturday of May (so May 6, 2017) is May Day in Madison. More than 800 volunteers of all ages (including my Brownie troop and families) work at locations around the town to pull weeds, spread mulch, and beautify Madison. I've also marked our calendars for Saturday, March 18, 2017, when the Madison Rotary Club and Foundation will have their End Hunger 3.6 Food packaging event. Volunteers (about ages 8 and up, though younger have attended in the past) will package 150,000 meals for distribution to more than 40 sites to feed the hungry in New Jersey and New York City. Many churches and synagogues coordinate volunteer activities that can involve kids. 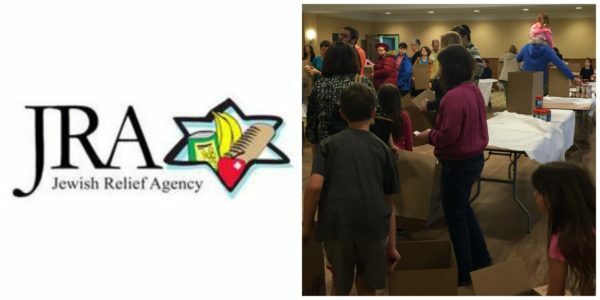 Our synagogue, Temple B'Nai Or in Morristown, participates in the Metrowest branch of the Jewish Relief Agency. Once a month, volunteers of all ages and backgrounds gather at a local temple to box up produce and kosher foods for people in need. Then, if possible, they select a route to personally deliver the boxes with a smile. I took my kids to the boxing event last May at our temple. They worked alongside other kids and adults to fill about 10 boxes each. Though I wasn't originally planning to deliver, I decided to choose a route in Verona and Caldwell, since I knew those areas. We delivered three boxes. One recipient was an older Russian couple in an apartment building who got tears in their eyes when they saw the kids at their doorstep. They both hugged all of us and, in their broken English, told us how much they loved seeing us and how they wait for their special box each month. The kids were silent the whole walk back to the car. Their discussions on the drive home were beautiful. I could feel how much this two-minute meeting had affected them. My daughter and I also participated in an event called "Stop Hunger Now" that took place last May at Madison High School that was organized by United Methodist Church in Madison. At this event, we donned hair nets, and worked alongside about 90 other volunteers (upper elementary age and up) to package more than 20,000 nutritious dried soup mixtures for the hungry in Haiti. We measured, scooped, and sealed bag after bag that afternoon, then helped box them up and load them on the delivery truck. To this day, my daughter still asks me when the next soup event will be. (I'll keep checking back at the church's Web site as no date is determined yet.) She knew that she had made an impact, and she knew that it made her feel great! Remember to check out Helping Kids to Give Back: Part 2 next week!